I had seen a dance, a wake, and a faction, but had never seen a fair; and being invited to occupy a seat in a chamber at Urlingford, which overlooked the field of action, I did so. "You'll not see such fun, ma'am, now," said my companion, "as you would have seen before the days of Father Matthew. Then we had a power of bloody noses, broken bones, and fine work for the police; but ye'll see fine cattle, and fat pigs; and may-be it's the bagpipes ye'd like." By ten o'clock all was in motion, and fatter cattle, finer pigs, fowls, and butter (none of which could the peasant ever enjoy) never adorned a fair. The first interesting object which closely fixed my attention was a rosy-cheeked, short, plump girl of about twenty, perched upon a stand, crying like an auctioneer, "Come, boys, here's the chance; only a ha'penny! Come now while it's a goin'; try your luck." What this luck could be I could not make out; the ha'pennies were continually pouring in, but what was the equivalent was not explained till all was over. She had a lottery-bag, containing all sorts of trifles, their names written on tickets, such as pins, needles, combs, tapes, ribbons, thread, &c. The purchaser drew a ticket from the bag, and might find perhaps a great pin, a needle, or a bit of tape; now and then the anxious eyes of the expectant might greet an article of value twice the worth of his ha'penny, while many went away with sorrowful hearts. It was said her lottery-bag at night was an exulting remuneration for her day's exertion, the cost of all that it contained in the morning being but very trifling. A ludicrous lesson of unlettered human nature was displayed by a company of tinkers selling asses. To recommend his own, to lower the value of his neighbor's, and to be heard above the rest, is the struggle of every dealer in these commodities. To accomplish these desirable objects, it must not be supposed that the forms of etiquette would be strictly regarded, and sometimes a box on the ear or the cheek, and a pulling of caps, if not of hair, among the women, (for the wives of these operatives are on the spot also) make up a ludicrous variety. The dress and dialect, the developement of self, the spontaneous wit, with the humble appearance of the uncomplaining donkey, make the scene to an unaccustomed eye one of amusing interest. One matron was this day carried from the field by the police. Leaving my eminence, I mingled in the group, hoping to be unobserved; but the good cabin woman, Mary's mother, found me out, and invited me into a house. I soon found Father Mathew was not there, for a young female was dealing out "the good creature" to a happy company; bagpipes were playing in the street door, and a jolly group were keeping time overhead by loud stamping. I was invited into a back apartment, where sat a company of men and women at the upper end of the table, with bread, tea, and whiskey before them, and a huge hog, dressed for the market, swinging to and fro over the lower end. "Welcome, welcome to Ireland!" came from every mouth, accompanied by a bowl of tea from a man, and a glass of whiskey from a woman. This finished the Urlingford fair; and turning away, I left the room without either tea or whiskey. 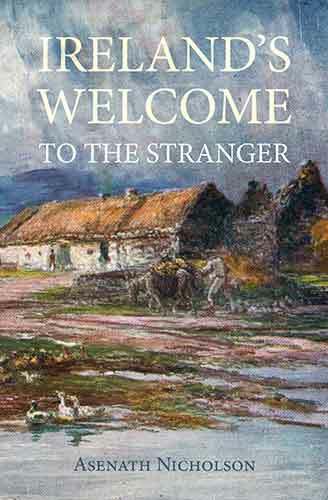 Ireland’s Welome to the Stranger is one of the best accounts of Irish social conditions, customs, quirks and habits that you could wish for. The author, Mrs Asenath Nicholson, was an American widow who travelled extensively in Ireland on the eve of the Great Famine and meticulously observed the Irish peasantry at work and play, as well as noting their living conditions and diet. The book is also available from Kindle.